Our Name Tags are ideal for all staff in contact with the public. Engraved names on laminated plastic, available with a locking pin, magnetic or a swivel clip back. 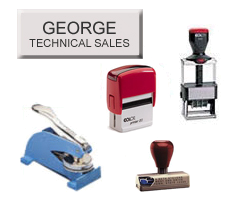 Package Plus Inc. also offers Desk and Pocket Seals, Self Inking Stamps, Numbering and Date Stamps, Engraved Desk and Door I.D. Plates.